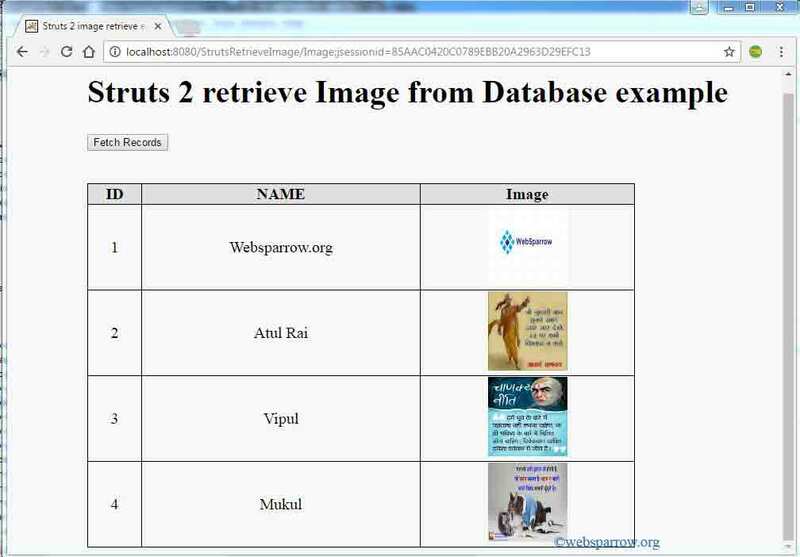 In this Struts 2 tutorials we are going to retrieve the images from database and display on JSP pages. As we know that to store the images in database we use the BLOB datatype. To retrieve the images we convert it into byte  array and write into OutputStream. To retrieve the image from database these JARS are required. Step 1: Add the struts 2 jars in lib folder. 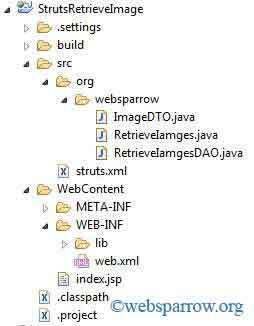 Step 2: Add the struts 2 filter in web.xml. Step 3: Create DTO class for the getter and setter of the fields. Step 4: Create DAO calss for access the database. Step 5: Create the Action Class to handle the data. Now you are all done. Run your application.